Even with the global financial crisis, more people are getting richer in China. By the end of this year, 320,000 people will each possess at least 10 million yuan ($1.46 million) of assets, up 6 percent from last year, according to a report on private wealth released on Monday by China Merchants Bank and consultancy Bain & Company. The total assets covered in the report, including cash, stocks, funds, securities and real estate investments, are expected to surpass 9 trillion yuan ($1.29 trillion) this year, up 7 percent from 2008. The 3-month survey, which started in late December on the mainland, polled 700 respondents through face-to-face interviews or questionnaires. All the interviewees had assets of at least 10 million yuan. Guangdong province had the largest number of wealthy people, with 46,000, or 15 percent of the country's richest, last year. It was followed by Shanghai, Beijing, Jiangsu and Zhejiang. The results of the survey did not surprise Ma Hua, who counts the rich among his friends. "The current crisis has had no impact on them because most of them are conservative investors," said Ma, deputy director of CCTV.com's R&D center. Ma said his friends made their fortunes by investing prudently in stocks. "Since they create wealth, and have not inherited it, they tend to be conservative in how to use it." The report found that 80 percent of the interviewees prefer investment with medium or low risk, contrary to previous assumptions that the rich prefer risky ventures. Liu Zhishuo, an angel investor in high technology, describes himself as a conservative investor. "I don't do short-term. I care about long-term value. 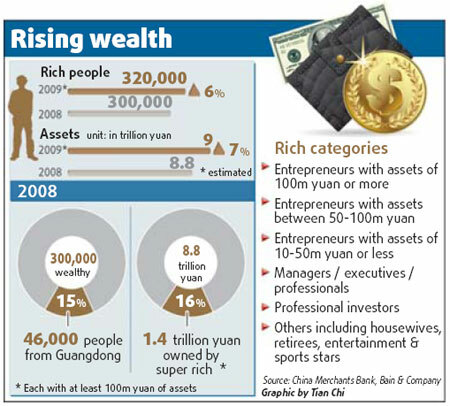 I invest if a company's value can increase progressively in 10 to 20 years," said Liu, who did not reveal his wealth. He observed that the odds of becoming rich quickly are getting thin. "You needs years of experience to grasp opportunities, not luck."